The stochastic oscillator is an indicator that is used in trading to determine levels of overbought and oversold. For a trader, this will mean the moment when it will be profitable for him to open and close his trading positions. Like all other indicators, the stochastic oscillator helps to predict the trader how a certain asset will behave. Invented it was around 1950. 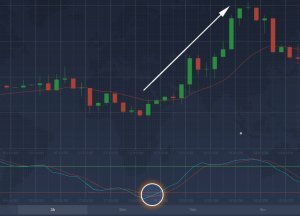 This indicator is designed to monitor the price momentum. According to the theory tested in practice, the price pulse reacts much better and changes its direction faster than the price itself. With this indicator, we can predict the point at which the trend will unfold. And tracking the trend in trading binary options will be one of the decisive factors. The stochastic oscillator has a number of features. It itself is the ratio of the last closing price and the range of low and high values ​​for a specific period of time. The idea that underlies the stochastic oscillator – the closing of transactions on an uptrend will have prices higher than the closing of transactions for the previous period. If the trend is downward, the closing prices of deals will be lower than for the previous period. On the chart, the stochastic oscillator is displayed by two horizontal lines and two moving averages. – The stochastic oscillator can range from 0 to 100. – Overbought and oversold levels are 80% and 20% by default. They coincide with two horizontal lines. Overbought will be an asset, the fast and slow moving average of which will be above the 80% level. Assets will be considered as assets with moving averages below 20%. Do not blindly trust overbought and oversold, because they will not always point correctly to the opening of “Put” and “Call” positions. The asset can be a significant time in both zones, which can confuse many traders. How to adjust the display of a stochastic oscillator? It is quite easy to do this. All you need is in the “Indicators” section of the list to select the Stochastic Oscillator you need. Not all brokers have this tool in their arsenal. We recommend that you look at the IQ Option website. Further in the tab click on the “Configure and apply” tab, if you want to use the indicator with the standard settings, then click the “Apply” button. If you understand what you are doing and want to use your own settings, at your disposal will be at least periods in percentage terms, as well as levels of overbought and oversold. The indicator should appear under the schedule of prices of traded assets. 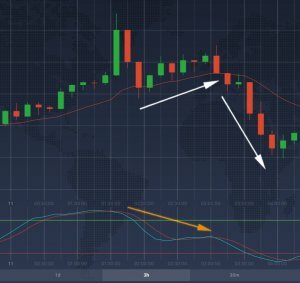 How to apply a stochastic oscillator in trading? A stochastic oscillator, like other indicators, must give signals to the trader for profitable opening and closing of trade transactions. In addition, our indicator allows you to determine the levels of oversold and overbought. How to use this indicator correctly – read further in the article. In fact, we will need to track the downward trend. In what cases will it occur? – When a rapid moving average crosses the slow one from below. The second signal is considered to be one of the additional signals, which indicate that the trend will be downward. Below you can see how it can be seen on the chart of the trading platform IQ Option. Here we are already talking about an uptrend. As in the case of overbought identification, oversold will have 2 signals – the primary and secondary. – Fast and slow sliding intersect below the level of oversold, we can expect an uptrend. – The rapid sliding crossed the slowest from above. This will be an additional signal that will indicate to us the expectation of an uptrend. Let’s look visually, using the example of a binary option IQ Option taken from the trading platform. The discrepancy pulls an indication of a trend reversal. 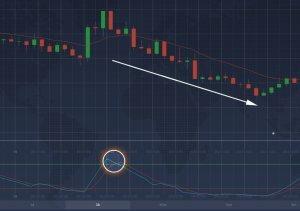 The indicator and the price begin to move in different directions, which can indicate both a reversal in the direction of the upward and downward trend. As the discrepancy in practice looks, we can see on the example of the charts from the broker of binary options IQ Option. If you have learned or already know how to use a stochastic oscillator, then for sure you have already performed your technical analysis more than once, much more effectively. A certain advantage of this indicator is its ability to use with other indicators in the trade of binary options. Do not forget to study well all possible consequences of using this indicator. A stochastic oscillator requires careful handling. It is almost impossible to master it in 1 session of trading. 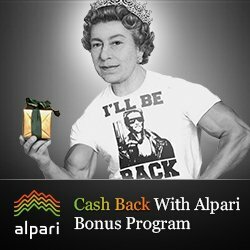 So learn to use it best on a demo account.